SMI celebrates its 25th anniversary. 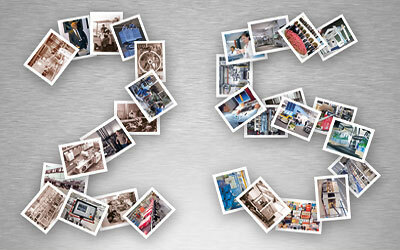 SMI, a worldwide leader among the manufacturers of hi-tech packaging machines and bottling plants, celebrates its 25th anniversary in 2012. The company can look with pride and satisfaction at the results accomplished since 1987 : 25 years of technological innovation, product quality and reliability, customer care and huge investments in research & development projects. With over 35,000 packaging machines delivered worldwide and estimated sales revenues of 101.2 million euros in 2011, the SMI Group has proved to be the ideal partner for many businesses operating in countless fields: food & beverage, chemical and pharmaceutical products, detergents, cosmetics and many more. "The best way to celebrate this important anniversary is to look at the future with the same enthusiasm that has been guiding us since 1987" - states Paolo Nava, the SMI Group's President & CEO. "Our unshakable commitment to the development of new technologies and innovative solutions has been awarded by our customers in terms of both turnover increase and worldwide market share growth over the years. The SMI Group has pioneered major breakthroughs in the packaging machinery sector without ever losing sight of product efficiency, customer service and continuous improvement of its own internal and international organization". "The know-how we have acquired in 25 years of business is our true point of strength, which enables us to turn new technologies into new opportunities for our customers, while seeking to anticipate their demands" - Paolo Nava says. Today the SMI Group's companies invest about 6% of their turnover in R & D projects. Over the last years SMI has been engaged in the design and manufacture of new products featuring two key factors: energy saving and system integration. The combination of these two major objectives has allowed the company to further improve its range of products by launching a new array of packaging and bottling machines with low environmental impact and capable of meeting the growing demand coming from the food & beverage market for eco-friendly solutions. The SMI Group has always distinguished itself for its special attention to machine's operational flexibility, safety and easiness of use along with an unbeatable quality/price ratio of its products. In order to fulfil such kind of needs, the company has recently launched some innovative solutions like the ECOBLOC® integrated system produced by Smiform division. It consists of a state-of-the-art equipment for the food & beverage industry, gathering into a single compact machine the operations of blow-moulding, filling/capping and labelling of PET containers from 0.25 to 10 litres; the ECOBLOC® series' systems can achieve a maximum output of 36,000 bottles/hour and feature a low value of TCO (Total Cost of Ownership), since they optimize functioning efficiency, energy consumption and manpower employment. If you want to know more about our range of products, please don't hesitate to contact us.